Speak Schmeak: Are you willing to have your beliefs challenged? Are you willing to have your beliefs challenged? This past weekend I attended the World Tea Expo to present a workshop on business networking. Also, to drink a ton of tea. This was my fifth or sixth time attending the conference and my second time speaking; what better way to combine two of my favorite things! One of the sessions I attended was presented by Kevin Gascoyne, professional tea taster and owner of of Camellia Sinensis, a tea company in Canada. His presentation was called "A Step Toward Caffeine and Antioxidant Clarity." I was intrigued by this topic because there is an overabundance of information about the caffeine and antioxidant contents of various teas, and it's confusing and inconsistent. Kevin (whose slides I hope to be showing you soon) quickly cleared up one mystery about caffeine testing in tea: Caffeine and antioxidant levels are not tested in tea that's prepared the way people actually drink it. When people prepare tea for drinking (in case you're not a tea drinker), they first boil water, then depending on the kind of tea (white, green, oolong, black or puerh), infuse a tea bag or loose tea leaves in the water -- either immediately or after it's cooled a bit. Tea is steeped anywhere from a few seconds to five minutes, and then consumed. Many factors, in addition to the kind of tea, play into how a particular tea is steeped, including the kind of pot one is using, the amount of tea, the amount of water, the temperature of the water, and more. To test caffeine, tea is ground up, mixed with distilled water (which one would never use for steeping as it renders tea flavorless) or other liquid, and possibly chemical compounds, and components are separated through liquid chromatography (the common denominator in both traditional research and Kevin's tests). Right there, you can see the problem. The caffeine content of tea processed in this way has nothing to do with the caffeine content of leaves prepared for drinking. Kevin decided to hire a lab to test caffeine levels in teas prepared in the same way as we drink them, using common pots, regular water, typical steeping times and typical ratios of tea to water. He chose a couple dozen teas from his company to test. Here's what we've all been told up till now about the caffeine content of tea: The amount of caffeine in tea is a direct result of how it's processed and its level of oxidation. This means that, in general, caffeine levels are expected to be highest in black teas, then diminish in order of oxidation levels: oolong, green, white. 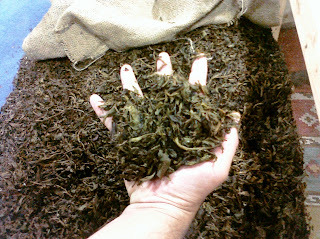 Puerh falls somewhere in the middle (puerh is a black tea that's been fermented after processing). Kevin showed us that this "conventional wisdom" is FALSE. His results chart showed a white tea in the eighth position after several black and green teas. There were green and white teas all up and down the list, and black teas near the bottom. There was no discernible pattern. In fact, one first flush darjeeling was at the top of the chart, while an autumn flush darjeeling from a different area of the same tea garden was near the bottom. There was a sencha (green) high on the list and a sencha low on the list. The purpose of this post is not to go into detail about why these teas had differing levels of caffeine (similar results were shown on the antioxidant test chart), but to point out that, for once, a speaker challenged conventional wisdom! How many times have I heard the tired old statistic that people fear public speaking more than death -- even though there is no recent study to prove this? But speakers and writers continue to blather on about this as though there were substantial evidence to support it. Certainly, many people fear public speaking, and as social anxiety goes, it's right there at the top. But more than death? No. In this case, Kevin took matters into his own hands, and paid for the research himself. The results were particularly eye-opening for him; he confessed to having steered customers who were caffeine-sensitive toward white tea, for example, because of the common belief that it was low in caffeine. In fact, I had gotten into a friendly argument with a fellow attendee the night before who insisted that her company's white teas had very little caffeine. But had she tested them? No. By sponsoring this research, Kevin was willing to have his own long-standing beliefs challenged. And they were. And thanks to him (and his book where the research is published TEA: History,Terroirs, Varieties), we have all had our eyes opened. As a result of this research, Kevin suggested that "the act of drinking tea must be appreciated for its own sake," regardless of caffeine and antioxidant quantities and that, if we're caffeine-sensitive, we stick with herbal tisanes. Sounds right to me! If you're a speaker or writer, do you repeat the same statistics you've heard over and over, without looking into their validity? Do you continue to repeat statistics even when you can't find any proof? It's easy to play on the emotions of your audiences, and boy do we love a shocking statistic. But when your statistics can't be backed up (and these days, your audience can Google your stats while you're stating them), you are the one who ends up losing credibility. Thank you, Kevin Gascoyne, for being willing to challenge conventional wisdom in this area. I was surprised that the session wasn't standing-room-only, but perhaps some attendees didn't want to have their worlds shaken and their beliefs tested. It's much easier to stick with the tried and true than re-educate yourself, your staff, your clients, your customers and your audiences.